For centuries, it was thought the writings of Surak existed only in fragments culled from the Nets or passed down from generation to generation through Vulcan’s long racial memory. That collective unconscious was described best in the words of Spock, Son of Sarek: “Every Vulcan experiences Surak’s time, and its events, to some extent, as if he or she was there….” (Duane, 1988, p. 41). Not long after his death, Surak’s original work disappeared, presumed destroyed by those who opposed his teachings. At that time, the Vulcan publishing industry was entirely electronic, and the populace was not in the habit of keeping personal copy. If one wanted to read a particular work, one logged into the Vulcan Planetary Network and accessed the Library. Downloads were unnecessary. It became something of a fashion to read Surak’s expositions. When they first appeared in 312 on the Nets, they were published as a series of musings and social commentary, much like one might post to a blog today. But it wasn’t long before the Philosophy Department of the Vulcan Science Academy approached the young man – he was only in his thirties then – about culling the best of his suppositions into a published volume. Given Surak’s growing number of followers, one volume soon became three. The works were collected as the Analects of Surak and were studied in great detail as part of the Department’s Curriculum. They were quickly renamed Savan-Don-Tak t’Surak, or the Teachings of Surak. Whether the power surge that destroyed the files containing Surak’s works was vandalism or accident, we’ll never know. If it was indeed deliberate, the act was carefully concealed in one of the strongest sand-fire storms ever to rock Shi’Kahr. Redundant backup systems were in place, but even those failed. Surak’s words, revered at that time by an estimated 2.53 million Vulcans were lost to the ravaging sands of time. Although Surak himself took no precautions to preserve his work – claiming “what is, is” – one of his followers did. Surak’s words were carefully transcribed into an archaic script that had once been used by maritime traders of the city-state of Dzhaleyl. The script of Dzhaleyl, unlike the fluid ceremonial calligraphy still treasured today, was designed to be a more pragmatic writing system – alphabetical in nature rather than logographic – suitable for quick business transactions. Surak’s works were disguised as the manifest of Dzhaleyl traders who cross-crossed the Voroth Sea. For centuries, these “logs” were preserved by a prominent family in the city until in 989, they were delivered to the Vulcan Science Academy for translation and study. Upon the discovery of the true nature of the scrolls, they were quickly spirited away to Mount Seleya for further analysis. But there the precious works were deemed unsafe during a period of frequent raids by the te-Vikram. The Monastery of Ulann in Kir Provence, home to an order of silent monks, secretly became the new home for the scrolls. Only one adept was permitted to know their true contents. He took great care to preserve the writing in electronic form and sealed it in a pyramidal case, coded and locked by ancient logograms. Unfortunately, he died suddenly of a genetic heart defect without passing on his katra – and thus, his knowledge of Surak’s writings – to another. Attempts to meld with his dying mind came too late. Over the millennia that followed, the secret that Kir Province harbored became so obscure – even to the adepts of Seleya and Gol – no one could define it. The secret, by then a mere legend, became known colloquially as the Kir Sha Ra, or “Kir’s Own What” – a rather tongue-and-cheek reference to the urban legend and the unVulcan-like pride accorded it. Most scholars accept this explanation for the name traditionally given to the teachings of Surak – Kir’Shara – but others have suggested a more spiritual rendering, stemming from Kir Sha A’tha, or “Kir’s Own Direct Experience of the Force” – the last two words becoming a phonetic glide over time. It wasn’t until 2154 that the Kir’Shara was found by the Syrrannites. Out on the Forge in 2137, a Vulcan archaeologist named Syrran located the katric ark of Surak, which had long been missing from Mount Seleya. Before returning the vessel to the priests of Seleya, he successfully melded with Surak’s katra, inquiring about the existence of any archived copies of the philosopher’s works. 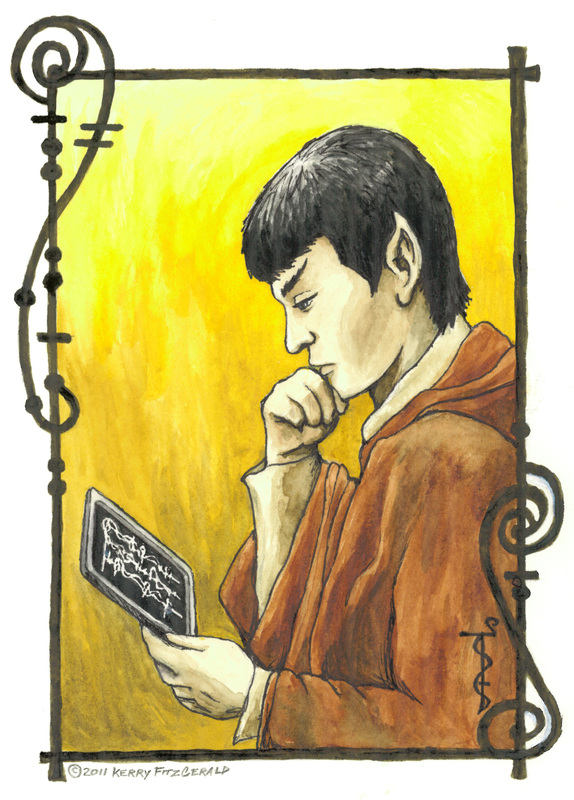 He learned that Surak did not know of the whereabouts of his analects beyond the copy stored in the Vulcan Library, but he thought that T’Klaas, one of Surak’s first students, made an encoded copy. Armed with Surak’s katra and the blessings of the Seleyan order, Syrran took up the trail of T’Klaas. The adept hailed from Dzhaleyl. It was there that Syrran found the descendants of T’Klaas, and through a series of successive melds, learned of T’Klaas’ work and the Ulann Monastery. Syrran traveled to the sanctuary on the coast of Kir, but there the trail went cold. It was an educated guess that brought him to the T’Karath Sanctuary on the Forge where Surak believed T’Klaas was entombed, along with the mummified remains of over a hundred others – all bearing no inscriptions, all unidentified. Syrran perished in a sand-fire storm before he could locate the Kir’Shara or the remains of T’Klaas. But in the instant before his death, he transferred his katra, along with Surak’s , to Captain Jonathan Archer, who located T’Klaas and the Kir’Shara. With him, the Syrrannites delivered the only surviving copy of Surak’s Analects to the Vulcan High Command. Under the reformed Vulcan government, the Kir’Shara passed to the care of Shupal (2132-2321), a professor of philosophy and linguistics at the Vulcan Science Academy. Although T’Kehr Shupal only held the rank of savensu (teacher or student professor), his rendering of the Analects in Traditional Golic Vulcan has remained the standard over the centuries. Shupal was deeply humbled when T’Pau placed the Kir’Shara in his hands, and he was heard to say that he was unworthy of the assignment. There were honored professors, he said, under whom he’d studied, not to mention numerous adepts at Seleya and Gol, who were masters in the Teachings of Surak. The writings had even been translated, he pointed out, into what would become Federation Standard English by Skon, Head of the House of Surak. Shupal also professed to be a follower of Dzharok (or Jarok), a rival of Surak. Their debates are some of the most important works in Vulcan literature. For that reason, some followers of Surak opposed Shupal’s appointment. T’Pau quickly silenced objections, stating that the works required fresh eyes and a working knowledge of the ancient Dzhaleyl script. Since Shupal was descended from the House of Derah, a prominent merchant family from the Port of Dzhaleyl, it was only logical that he undertake the task of interpreting the writings stored within the Kir’Shara. Shupal made many journeys to his ancestral homeland and to the various places of honor in Shi’Kahr, where Surak lived and worked. He successfully melded only once with Surak’s katra before it was believed destroyed in the Romulan-Terran War. While still a young man, Shupal left his teaching post at the Academy to live the life of an adept, joined by his bondmate T’Pirmah, and worked to rebuild the T’Kareth Sanctuary, originally founded by Surak and bombed by the Vulcan High Command. The irony that Surak’s writing’s should be encoded and preserved in enemy script and then brought again to the surface by a descendant of that enemy is not lost on any Vulcan. Information on the constant power struggle between the city-states of Dzhaleyl and Shi’Kahr can be found here. Shupal divided the Analects into three volumes – although it was unclear to him where one originally ended and the next began – and into thirteen chapters. Each chapter covers an og-elakh, or thread, begins with a kohlan or meditation on the subject, and concludes with naph, or Surak’s summary thoughts. The volumes are offered here, first in the Traditional Golic Vulcan, followed by a translation into Federation Standard English. Duane, D. (1988). Spock’s world. New York: Pocket Books. The way of kolinahr: the Vulcans. (1998). Culver City, CA: Last Unicorn Games. Star Trek is owned by CBS/Paramount. Text Copyright Kerry A. FitzGerald 2011-2016. The artwork is a nice touch. I look forward additional posts in the future. You are most kind. We hope to make more of T’Rel’s work available soon. Dom, ki’sarlah. T’forti – nam-tor trensu t’vesht-var svi’etek. Lau-tam-tor ruhm vaikausutra t’Kolinar..
Ri ki’gla-tor nash-veh tam-tor vaikausutra t’Kolinahr. Glakuv sem-rik. Thank you for trying to bring together the disparate sources regarding Vulcan and Surak in order to make something of a well thought out, cohesive whole. Many times I’ve been intensely frustrated by the inherent inconsistencies in canonical and non canonical lore, and you have done a good job here. Fascinating. Most fascinating. Your comment is most appreciated, Rohvannyn. I am gratified that you find my efforts of value and hope you will continue to do so in the future. If there is any particular subject matter you think I should address within the context of this site, please don’t hesitate to make suggestions. Thank you for posting such amazing and informative information abouts this little known time in the V’tosh history. Very interesting work and informative structure. I am most gratified that you find my work informative. Do you have any ideas as to the reason that vulcans do not eat with their hands? Until modern times, food sources on Vulcan remained scarce. Vulcans learned early on how easily those precious sources could be contaminated. The taboo of handling food with bare hands developed simply as an effort to stop the spread of pathogens. Today, with the development of better sanitary conditions in most worlds, Vulcans are occasionally known to eat foods without utensils, but many find the practice distasteful. Also, many Vulcans are in the habit of working through meal breaks, and using utensils keeps the fingers clean for working with touchscreen devices. This is such a wonderfully done resource. It’s amazing and so very in keeping with all things Vulcan.